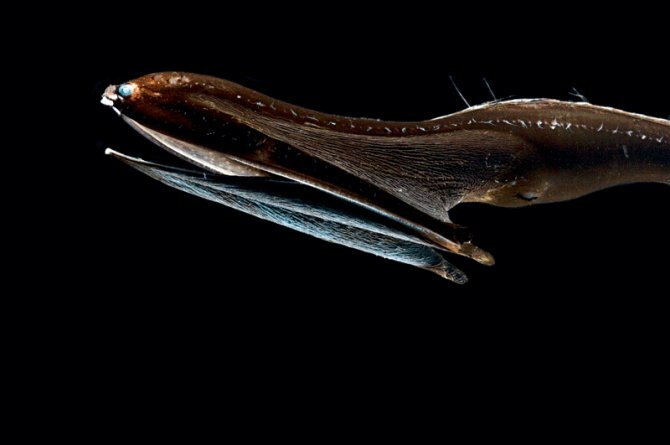 Our trawl through some of the stranger fish of the world's waters seems to become more fertile the deeper we go, and this week's subject, Eurypharynx pelecanoides â€“ commonly known as the Pelican gulper eel â€“ is further proof of this. Check out the video! With its mouth closed, it looks more like a rather soggy sock puppet than an efficient deep sea predator, especially with its button like eyes on the tip of its nose, but once it deploys its enormous gape to full effect it becomes clear where it gets its name from. Hanging in the abyssal darkness the fish simply opens its huge mouth, and with the aid of a bioluminescent tail tip lures unsuspecting denizens of the deep towards it, where they are quickly engulfed and swallowed. With meals often few and far between in the deep, the fish is capable of swallowing prey of considerable size which it fits into its extendable stomach, but studies of captured fishes gut contents show that much of its diet is made up of crustaceans and smaller fish. It's the only known member of the family Eurypharyngidae, whose name is derived from the Greek for 'good pharynx' which it certainly has judging by the size of some of the prey it swallows! Growing to around 1m/3ft maximum, these ocean oddities also have one final notable adaptation. Their lateral line sensory organs are found upon a row of raised tubercles rather than the more usual pores, which it has been speculated may increase their sensitivity - another handy tool in finding food in the abyss. They are resident throughout the world's oceans at depths between 500-7625m/1640-25,000ft.